‘Furzefield’, once housed suffragettes when Peaslake in Surrey was a popular base for the movement. The six bedroom home has been carefully renovated to provide a family home set within seven acres of private grounds with a paddock and orchard. 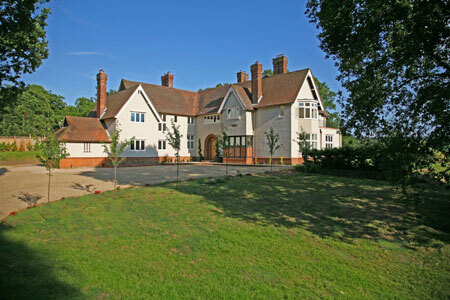 The house has recently been renovated by local developers Tillingbourne Homes. The external façade features original hand made clay tiles, chimneys, brick detail and some wooden windows which have been retained and restored alongside traditional bay windows and original clapboard detailing. A double height galleried entrance hall leads to a large drawing room and separate dining room, both with bay windows and rear garden views. The Poggenpohl kitchen and breakfast area features a range of highly specified integrated appliances include steam oven, two conventional ovens, combi microwave, two large fridge freezers, dishwasher, wine cooler unit and zip tap providing filtered boiling and cold water. Furzefield has enjoyed a rich history, and is believed to have been used as a home for Suffragettes when Peaslake was a popular base for the movement in the early 20th Century. Here the then owner Miss Paine invited St Mark’s Sunday School to use the use a room as a base. Today Peaslake retains a unique picturesque charm and sense of seclusion which has long attracted artists to live and work in the village and made it a popular location for television filming. Situated in the centre of the Surrey Hills the village is surrounded by attractive forests and downland and is a fantastic location for country walks and cycling. Price: £4.25m through estate agents David Carter at Hamptons Country Houses on 01483 572864 or Michael Parry-Jones at Grantley on 01483 893939.